Has your right-click context menu gotten slower and slower with every passing day? That often happens after you install more and more software applications, which try to give you fast and easy access to their features by integrating them into the context menu, but only end up slowing you down. The first step in reducing clutter in your context menu is to figure out which applications that are listed you use most. Those are the ones you should keep. The rest should be removed with a tool like FileMenu Tools. 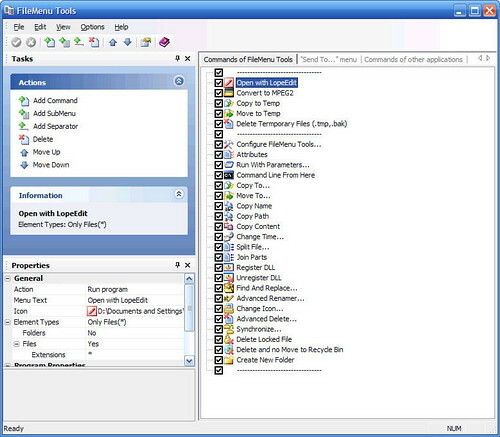 The free FileMenu Tools lets you customize your context menu by enabling or disabling commands that were added by other programs, contains a list of custom commands that let you do simple operations on files and folders, and lets you change the "Send To" submenu. Once you start FileMenu Tools, just uncheck the commands that you don't need to remove them from your context menu.